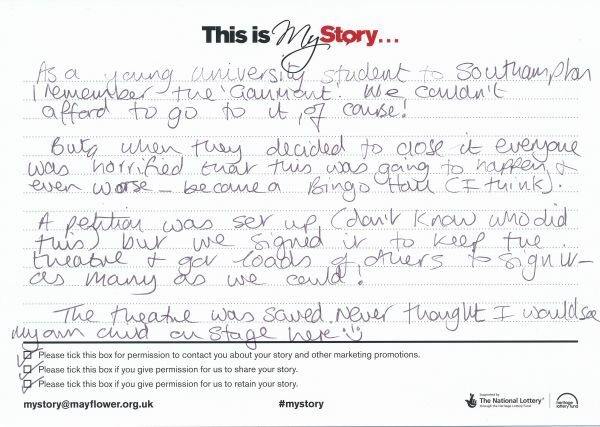 My Story card: Aine Parker remembers being on of 93,000 signatories that saved the theatre from closure. As a young university student to Southampton I remember the 'Gaumont'. We couldn't afford to go to it, of course! But when they decided to close it everyone was horrified that this was going to happen and even worse - become a Bingo Hall (I think). A petition was set up (don't know who did this) but we signed it to keep the theatre and got loads of others to sign it - as many as we could! The theatre was saved. . Never thought I would see my own child on stage here.